"The Rain of the Supermen"
One second after New Year's Eve, all Everyman Project metahumans in flight find themselves depowered and plummeting to the ground, causing massive destruction in their wake. Those "Everymen" on the ground experience the same malfunction, some losing their lives in an effort to save both civillians and those in descent. At the same time, atop the roof of Lexcorp Towers, Lex Luthor watches the raining bodies, completely emotionally distant, and describes the carnage on his cel to Dennis. Pausing to avoid a falling metahuman with little effort, Lex then feigns innocence, claiming no knowledge as to how this happened, while a grin says the exact opposite. 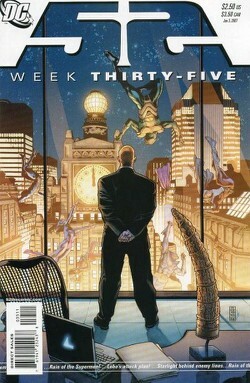 Elsewhere, John Henry Irons runs out of his lab after hearing the news reports on the radio, while Supernova spots Luthor on the roof and confronts him. Sarcastically, Luthor claims he's shocked and adds "if only Metropolis had a SUPERMAN who could stop this chaos! Oh well." Just as a gas main starts to erupt, Supernova teleports 10,000 to the outskirts of Metropolis which at first looks as though he had incinerated them. Infinity Inc (the only ones still empowered) do what they can to stem the loss of life, all the while wondering why they didn't suffer the same power disruption (Natasha Irons, most of all). Mainstream heroes - notably GL's John Stewart and Guy Garnder, Hawkwoman, CM2, Power Girl, Dr. Light, Beast Boy, Raven, and Obsidian - help transport injured civillians, and suffering Everyman metahumans. There are also heroes who sustained injury, like Plastic Man's son, Ernie O'Brien aka Offspring, who stretched himself beyond his limits to save twenty falling Everymen. Puzzling to some, there are Everymen who are dying from the very nature of their powers, as though the DNA is rejecting the genetic modifications the Everyman Project oversaw. John Henry Irons appears and says it's the exact same thing that happened to him and this confirms his suspicions about Lex. John tells Beast Boy to gather the Titans. In hospital gowns, Infinity Inc listen to Lex (Mercy present) explain that now they've isolated the "errant gene-sequence" they've begun screening for it and the test results conducted on the team prove negative. Nat isn't as relieved, nor as willing to help Lex in his plan to have Infinity Inc aid in regaining the public's faith in the Everyman Project, noticed only by Jake. Later on in her room, she stares at a picture of Trajectory on her laptop just as Jake comes in to see if she's ready for the press conference Lex called. Nat admits that she should've listened to her uncle's warnings, admitting he knew something like this would happen long before Trajectory died. Nat suspects Lex orchestrated what happened on New Year's Eve, and Jake agrees to help her find evidence to confirm her suspicions out of his love for her. In deep space, Starfire, Emerald Head, Animal Man, Adam Strange and Lobo finally come across the remains of Planet Vartu, now completely destroyed after the campaign of the Stygian Horde, as described to them via telepathic message from Captain Comet. All that remains are debris and an abandoned Green Lantern uniform. While Starfire and Animal Man discuss the fate of Comet or where to find the Horde, Adam Strange then brings up to Lobo how convenient it is that a) Lady Styx has a bounty on their heads, b) Devilance the Pursuer, a bounty hunter, walked into a trap, and c) Lobo is left with the spoils. He insinuates that Lobo brought them all this way to claim that bounty for himself despite his promise of reform, and that three people inside the machine could do a lot of damage. Adam returns to the duo and announces a change in plan. Lobo says "there ain't no need to figure out how yer gonna fight...'cause I'm taking ya straight TO her." Main Story - 4: When you read this story, it's barely noticeable that it's so short because so much happens in 23 pages. This is classic Lex, for starters. This is so reminiscent of the early days of the John Byrne run, specifically the Man of Steel miniseries in issue #5. Feigning innocence while his smile reveals he IS behind something is his trademark because in his heart (or whatever's keeping him going) he knows he can get away with it. You can already guess though how he gets from this point to being a full-fledged fugitive in the One Year Later storyline. I still have my suspicions about Jake; his agreement to help Nat is too easy, too compliant for a Pro-Lex supporter. And I can't wait to see how John takes up the fight with the Titans to take down the Everyman Project. The title is a definite allusion to Jerry Siegel and Joel Shuster's original concept for Superman, entitled "Reign of the Superman", in which Superman was a villain with mental powers. Then again it also goes back to the intro of Steel, Superboy, Henshaw, and the Eradicator following Superman's death, which was called "Reign of the Supermen," as a play on words. Finally as for Lobo, it's hard to tell whether Adam Strange is right, or whether he and Lobo have concocted a strategy to take down Lady Styx. The picture of Lobo with blood on his face does seem to show a definite fall off the redemption wagon for the Main Man. For all we know it could be Fishy's blood, but then again he always favors those dolphins right? Anyway can't wait for #36. Great writing! Art - 5: I know the credits say Jimenez and Jurgens, but in some scenes it resembles Tom Grummett's style, especially in the female figures. This time Griffen's breakdowns work great, especially in the carnage of New Year's Eve. They captured the chaos and destruction magnificently, as well as deliver a great-looking Lex through light and shadow effects. And yeah in some parts with his brow furrowed he resembles Byrne's take on him. All in all, the girls look great, the heroes look powerful, and the backgrounds are excellent. Cover Art - 5: One word: Awesome! Showing a calm and collected�Lex watch as his Everymen fall to their deaths in the name of his blind ambition is brilliant. It totally�cements Luthor as the greatest villain in DC history.